Now the essential items needed on a hike could stay dry and just be strapped to the top of the dry bags on my boat and be ready to go in a moment. This was the case a few times on a recent rafting trip in the Arctic when we spotted some wildlife from the river and wanted to hike in for a closer look. 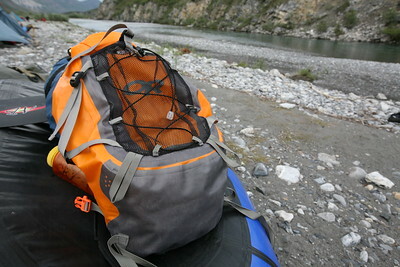 With a standard dry bag style rolling closure on the top the Ridge Sack performed as any dry bag would. A cargo net strapped on the outside made for easy access to important items like bear spray and lightly padded shoulder straps made the pack comfortable to wear even when packed full of heavy photography equipment, water, food and rain gear. The sternum strap has an emergency whistle built in and there is a thin strap and buckle set up as a waist belt which helps more when running with the pack then for standard walking use. The OR DryComp Ridge Sack preformed as expected. Recommended for any wet trips.